Once again, a very busy month for McKenzie as we continue to work with a number of our partner organisations which include: The Chartered Institute for Accountants (England and Wales), The Law Society, Kent County Council, The Architects Registration Board, Symphony Housing (see photo) and many others. Following the recent vote in the UK to leave the European Union, many of our customers have asked us about the potential implications this could have in respect of Equality and Diversity – particularly the legislative framework. It is worth stating that the principal framework for Equality laws – The Equality Act 2010 is UK law, passed by Parliament. Although it was, in part, originally modelled on E.U. Equal treatment directives, imminent changes to this act (post Brexit related) are unplanned and unlikely. Also, from a commercial perspective, if the UK wishes to continue to trade in Europe, it is likely to continue to follow any key developments in respect of EU equal treatment directives or legislation. A slightly different story – we think. Whilst the Human Rights Act does actually originate from the Council of Europe (separate from the EU), there has been considerable conjecture about developing our own ‘British Bill of Rights’. We predict that the Human Rights Act will be replaced by a domestic (rather than European) framework to coincide with Brexit. We may be wrong of course, don’t hold your breath either way ! What will definitely change of course is our relationship with the European Court of Justice. Brexit will mean us ending our formal relationship here so the future prospects of British people having their cases of discrimination ultimately decided in Europe is likely to come to an end in the future (Do you remember the nurse who wanted to wear a crucifix for work ?). How will Brexit affect the flourishing and diverse profile of Britain. Better ask the person who will be running the country in the future – once we know who she is ! The ‘she’ factor is of course an excellent female role model in the Gender equality debates. People will disagree with us on this we know. But it is worth reminding ourselves that much UK employment law, whilst influenced by EU frameworks is ‘home grown’ or if you prefer ‘domestic. For example, unfair dismissal rights, paid holiday entitlement and shared paternity leave all exceed current EU minimum requirements. Bexit should not therefore require major revisions to UK employment law. Of course, future governments will continue to amend rights, we again predict very little changes to workers rights in the short to medium term. 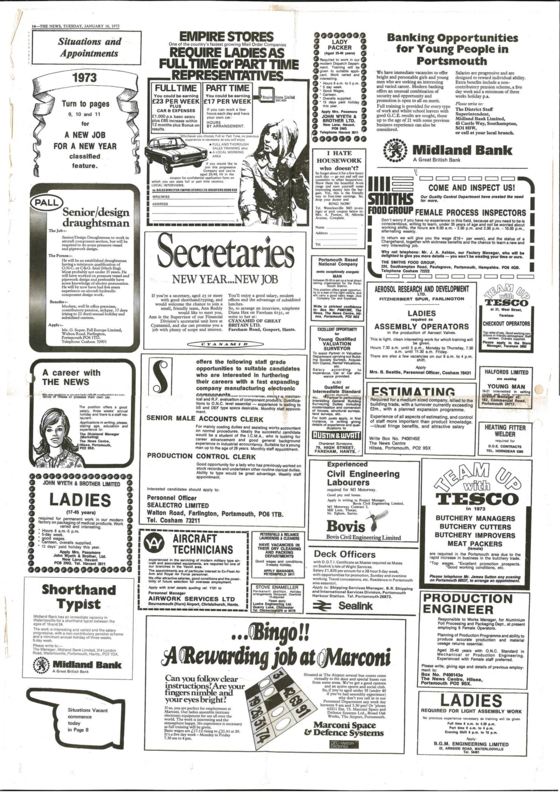 Those of you who work with McKenzie will know that we just love the nostalgia of those old British job adverts. A time when equality meant ‘separate’ opportunities for men and women. Thank you to Alison Bourne from Capita for sending us this photo she found in the archives of Capita.